Several years back when we first got into the tech consulting field, a group of us wanted to figure out a way to explain tech to people in a way that made sense. We knew that talking tech to people didn’t work. And so, through some trial and error and a lot of customer feedback, we came up with 4 areas of tech that resonated with people. While originally these four pillars were used as a way to describe our services to business owners and people responsible for the tech in their business - they have since become so much more. Many years later, as we developed a more complete methodology around managing tech, these 4 core areas have remained. They have stood the test of time. 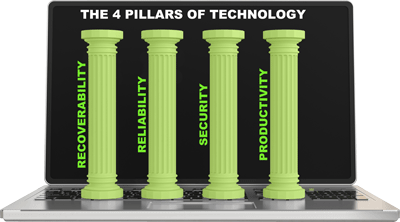 And as a result, they have been dubbed...The 4 Pillars Of Technology. Click above to get an overview of each Pillar. The 4 Pillars are interrelated meaning that they build on each other while at the same time they complement each other. To achieve the ultimate goal of Productivity it’s important to have the other 3 Pillars in place. It’s an all for one and one for all sort of thing. When Connections for Business on boards a new client we evaluate your business against The 4 Pillars to build an initial road map for your tech. Then with a plan in place we're able to help get your environment to where it needs to be. 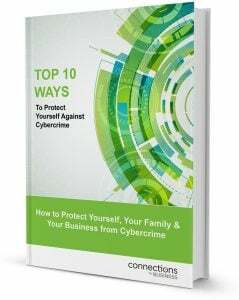 Recoverable, reliable, secure and productive.